Performer removes his ATM or Credit Card from his pocket and freely displays it along with a plastic folder. 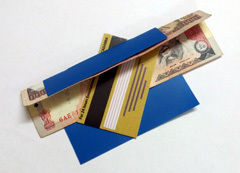 He borrows a currency note and places it inside the folder with the ends projecting on both sides and visible at all times. He then pushes the complete credit card through the bill and out from top of the folder. He finally returns the bill to its owner who can examine it thoroughly.